The Bruce Ski Club and its partners offer many opportunities for children and adults to learn to cross-country ski. Learning to ski is not as difficult as you might imagine. With the right equipment, proper clothing and a little instruction, you can be skiing the trails in no time. The Bruce Ski Club has no shortage of cross-country ski trails at all of its locations that are ideal for beginner and novice skiers. Here are some of the programs and events offered by the Bruce Ski Club that will help you learn to ski or improve your skills. For the latest information, check out our events or Facebook page. Jackrabbit cross-country ski program for children: A great way for children to learn ski technique, build lifelong friendships and have fun. 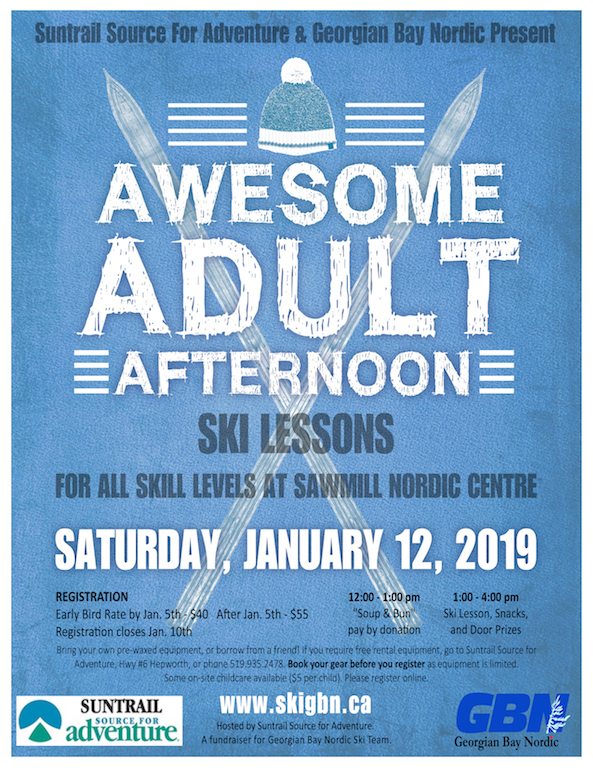 Awesome Adult Afternoon Ski Lesson – This Georgian Bay Nordic fundraiser will help you learn to cross-country ski in just a few hours. Equipment is available for those who need it. Cross-Country Ski Swap – If you are in need of used ski equipment, the Ski Swap is a great place to find it. Held at Suntrail Source for Adventure in Hepworth, Ontario. Ski Too Far: When you are ready to go the extra mile (or kilometer), this event will give you a chance to test your cross-country skiing endurance — just keep skiing, that’s all there is to it. Cross-country ski equipment can be purchased or rented at Suntrail Source for Adventure, a short drive from the Sawmill Nordic Centre in Hepworth, Ontario.